Army 1st Lt. David Johnson was killed in action in Afghanistan, according to family members. Johnson was a 2006 Mayville High School graduate, said Katie Leb, a friend of the family. US Army 1st. Lt. David Johnson, who was killed in Afghanistan last week, is the son of Andrew and Laura Johnson. Andrew Johnson is publisher of the Dodge County Pionier and was president of the WNA Board of Directors in 2010. An Army officer from Mayville was killed in an explosion in Afghanistan about a month after beginning his first deployment overseas, family members said Thursday. 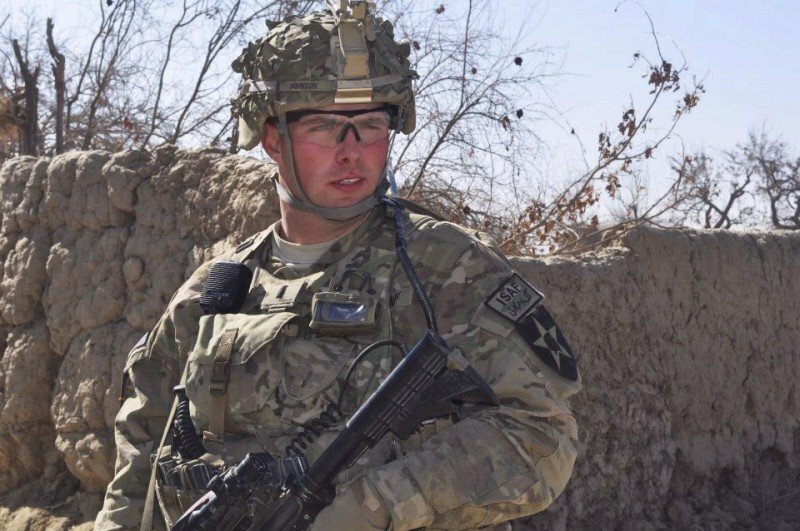 First Lt. David Johnson told friends earlier this month that he had been placed in charge of a small firebase the military was building up in a dangerous part of Afghanistan, said his uncle Peter Johnson, a Chicago attorney and family spokesman. "He was a very brave guy," Peter Johnson said. "He was fun-loving, never complained. He was very likable." The uncle said he was proud of his nephew, but didn't entirely understand why the military so quickly gave him command of a firebase, an encampment that provides artillery and other support to other units. "He'd been training for a very long time (in the U.S.) and had just been in the field a very short time. He was just promoted in December at the time of the deployment, and he was the highest-ranking officer at the camp. "I don't know why they would put someone with that little experience in that position," Peter Johnson said. "Leading missions, you would think they would get someone who wasn't on his first tour." David Johnson and the platoon he led were "certified as mission-ready to deploy" after months of training at Joint Base Lewis-McChord in Washington state and other facilities, said base spokesman Joe Kubistek. The 24-year-old soldier had reported in January that he felt lucky to be leading a platoon-sized base in a "very active" part of Afghanistan, his uncle said. David Johnson wrote on a Facebook page for friends and family that he was able "to plan, lead and execute my own missions" and work with Afghan civilians and soldiers to prepare them to take over: "As the year goes on we are going to build up the base for ... more to come and push the local populace to set up village run check points to increase security." Johnson was on foot patrol in Kandahar Province on Wednesday when he was killed by a homemade bomb, Kubistek said. "We are very proud of our son," his parents, Andrew and Laura Johnson of Mayville, said in a news release. "He is a hero. He first was a man of God. He has been a strong leader at Mayville High School, at Evangel University and to the men in his unit. David had no fear of adversity; he lived life to the fullest. There are no regrets. He is an American hero. We love him very much and miss him very much." Andrew Johnson is publisher of the Dodge County Pionier in Mayville. "In this town the Johnson family is well known and well loved, and to lose David has saddened everyone," Leb said. "Everyone here was tremendously proud of him and what he did for our country." Johnson's family on Thursday was traveling to Dover Air Force Base in Delaware, where the soldier's remains were being sent. Peter Johnson said the parents would return home Friday, but that the Army would not immediately release the soldier's body. The family released a statement attributed to retired Lt. Col. Kirby A. Hanson, who was David's ROTC commander: "David was an outstanding cadet in every aspect of military training. ... He was destined to serve in the Infantry, and I was certain he would excel. ... Aside from the Army life, David was a kind, well-mannered, fun young man." 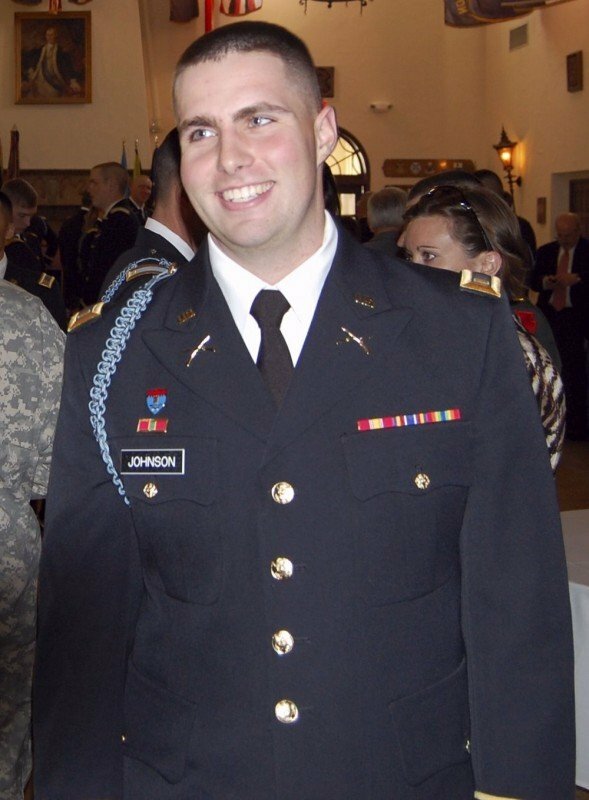 Johnson, a member of 5th Battalion, 20th Infantry Regiment, 3rd Stryker Brigade Combat Team, 2nd Infantry Division, was awarded the Bronze Star and Purple Heart posthumously.